Explore a sampling of 17th-century America aboard Godspeed, a newly commissioned replica of one of the three original ships that in 1607 brought America's first permanent English colonists to Jamestown! Godspeed has been port hopping along the east coast all summer, throwing a "Landing Party Festival" - featuring live musical performances, family entertainment, historical and cultural displays highlighting the legacies of Jamestown and the growth of America -- all free to the public, at each port. It's final stop before returning to Virginia is this week (it already started) and lasts through this weekend in Newport, RI. Once again, all events are FREE, so if you're anywhere near Rhode Island this weekend you should definitely check this out! Last Wednesday we featured our inaugural boat of the week - a 33' Doral Elegante - which was selling for just shy of $200K. This week, we're not playing around anymore. Built in 1999, this 105' Baglietto is a sleek European style motor yacht which comfortably accommodates 8 guests in 4 elegant staterooms, and also has separate quarters for crew. You want it as bad as we do and have an extra $6 Million laying around? Simply call 1-800-886-8164 and the nice folks at Precision Marine Yacht Sales in Palm Beach Gardens, Florida, will be happy to let you take it off their hands. Get into trouble while underway? Press an "SOS" button, and like 911, help will be on the way. Is this system for real? It's out there, and it's called SeaKey. And like GM's OnStar for automobiles, SeaKey provides instant communication to a 24 hour, 7 day per week response center. Best of all, SeaKey recently announced that it can now be offered as an option with virtually any brand of boat. Not expecting any emergencies? No problem! SeaKey also provides concierge services rivaling those offered with your AMEX black card, so you can push a button and make reservations for a transient slip, dinner, and tickets to a show in the port town you're visiting, all in one call. Last week, we mentioned how hard it is becoming for owners of "average" sized boats to find slip space as marina operators make way for mega yachts. But what do marina operators know that you don't? Well, they must have read a recent report from the National Marine Manufacturers Association, which stated that total units of powerboats were down last year by about 1%, but spending was up over 4%. What? In a nutshell, people are buying less boats, but the boats they are buying are bigger and cost more than ever. People are buying bigger and bigger boats! With the soundtrack to the upcoming movie version of Miami Vice being announced last week, it is hard to resist offering you the original theme song as this Friday's nautical nugget. You can't tell me that the hard hitting beat of that Jan Hammer tune does not play in the back of your mind every time you accelerate your powerboat; you know it does! For a fun version of today's Sea Song, check out this site. They are trying to sell a Miami Vice limited edition Scarab by using a home video and the original theme song playing in the background. Make sure you turn up your volume! San Diego is a beautiful destination all year long, but when you've got an excuse to visit the city like a boat show, how can you pass it up? Few venues capture the energy of outdoor summer fun on the water than the seaside recreation Mecca of Southern California itself, San Diego. See for yourself why - in only its third year - the San Diego Summer Boat Show has established itself as a premier event among boaters in the southwestern United States. Chartered Yacht websites are a dime a dozen (haven't used that phrase in a while! ), but how do you know which offers are real, and which websites are merely scams? It's not easy, but luckily we came across one that we know is the real deal. International Yacht Charter Group does not own a few yachts in one location, but provides access to a network of available luxury crewed yachts, and they will help you pick the right one in the same manner a travel agent would help you pick the perfect vacation. They pride themselves on being able to identify the perfect choices that meet the needs of every individual customer, and in making the cumbersome paperwork process seem simple. Best of all, they are run by a group of REAL women - all listed on their "about us" page - including a former executive of YachtStore.com. So if you're looking for a charter agency you can trust, and a vacation where you really get to relax (on somebody else's boat! ), check out International Yacht Charter Group. The Maltese Falcon, which claims to be the largest and fastest personal sailboat in the world, was launched in Italy over the weekend. She's an 87.5 meter (287 ft long) yacht with three masts that are 57 meters tall (187 ft). She looks like a 19th century clipper ship, but moves like a rocketship. Who would commission this type of super-mega-yacht with all its high-tech bells and whistles? Venture capitalist Tom Perkins of Kleiner Perkins Caufield & Byers, that's who! Mr. Perkins, a mega-rich Silicon Valley Pioneer, has served on the board of tech heavyweights such as HP, Compaq, Philips Electronics and Tandem Computers (where he served as Chairman for 23 years). Read more about the gadgets on MercuryNews.com or Cnet. It's Friday, and if you're not already boating this weekend, then you are probably either thinking about being on the water or planning your excursion. DailyBoater is proud to bring you a little music to accompany your journey. Each week (unless we change our minds or get distracted) we will share a sea shanty - or at least a song that has some sort of nautical theme - to help get you in the right frame of mind for the weekend. If we can find a clip of the song, we'll share it; if you can get the tune on itunes, we'll give you the link. This isn't old-napster or China - we respect the rights of the artists that produced this great music and don't want to rip them off. The artist is banjo-strumming Dock Boggs, and you can find this song on a collection entitled His Folkways Years, 1963-1968. Hey, with a name like "DOCK", how can we go wrong with this pick? You may go out on the water to get away from it all, but sometimes you just need to connect. You know, check your email to stay in touch with clients or employees, search for a restaurant in your next port of call, or maybe even read each day's edition of DailyBoater! Well, you can't go dragging the phone line across the ocean or lake, let alone out of the harbor, so what's an Internet-addicted boater to do? Well, we see at least a couple of options. 1) Stick with ports that have Wi-Fi access, so you can at least wirelessly connect while your docked without any messy phone lines or dial-up charges. Visit WiFiMarine.org, an information hub that will provide you with the skinny on ports offering Wi-Fi for free or for a small fee. 3) Lastly, if you are staying close to shore, and want wireless access both on and off the boat but don't want to pay Starbucks for the privilege of their service, consider a Verizon Wireless Broadband Card. It looks like $60/month will let you access a highspeed connection from anywhere they have towers. Check out this real life example of somebody hooking one of these up for the whole family on a recent (current?) vacation on a 43' yacht: (MamaMusings.com). An article that ran in the LA Times over the weekend described how marinas are accomodating the growing number of luxury yachts by combining and eliminating slips designed for smaller boats. The average pleasure-boater with their measely little 20 to 40 foot toy (like this author) may soon have no other choice but to trailer or drydock as the condition worsens. Actually, there is one other alternative for us "small" boat owners... buy a bigger boat! The weekend is upon us; are you reading this at the dock while checking the weather and wishing you had a frozen daiquiri to cool you down? We've seen a bunch of blenders that claim to be "boat blenders" because they attach to a drill, run on re-chargeable batteries, or are hand-cranking people-powered units, but we have not found any of these to crush ice as well as the bartender at Jimmy Buffett's Margaritaville cafe in Key West. There are now gas-powered blenders as well, but they just sound like they smell bad! The key to effective mixology while underway is to use a real blender from a trusted appliance maker, and there are few brands that rank up there with Waring. And with Waring's professional grade blender that features both a 12 volt plug with a 14 foot cord AND an unbreakable 48 oz carafe, this is the obvious choice for all your boating (and tailgating) adventures. All that's required is a 12 volt outlet/cigarette lighter, some daiquiri mix and a bottle of rum. Oh yeah, and lots of ice! Visit a price-comparison sites like BizRate.com to find the cheapest and most reliable place to buy this blender. We found the Waring Tailgater TG15 for about $100 at most stores. I think we're supposed to say something like "drink responsibly" right about here, so there you go. They say the two happiest days in the life of every boater is the day (s)he buys a new boat and the day (s)he sells it. Today is a happy day for us, as we launch our new daily endeavor to spread happiness to boaters everywhere... Let's just hope the 2nd happiest day doesn't come too soon! The tradition of breaking a bottle across the ship's bow began in Britain in the late seventeenth century. We carry on that tradition today, and hope you'll join us in a ceremonial glass of fine champagne, wine or whiskey as we say, "I CHRISTEN THEE, DAILYBOATER.COM!" She's an ambitious ship with a lot of potential. Will she really visit everyone that yearns to see her every single day, even as the number of suitors increases? That really is the plan, but only every weekday... She's spending weekends and holidays at sea! 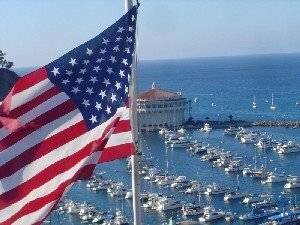 A special note to our American boaters: we wish you a happy and safe Independence Day. Where you get the scoop on the latest tips and trends from the world of boating. Available for free in a daily newsletter and website, DailyBoater.com. If you are into sailing, powerboating, skiing, fishing, or traveling the world on your MegaYacht... DailyBoater is your source for news about the best that boating has to offer.